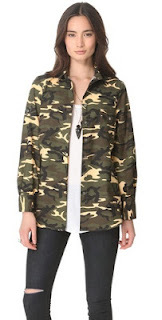 Thayer's classic button shirt in camo retailed for $191 at Shopbop, now on sale for $76.40. Forever 21 has a less expensive option if you want to try out this look for less. It retails for $27.80 and you can click HERE to purchase.